would you sign me a lease ? WHAT IS THIS LAUGHING ALL ABOUT? what is this laughing all about ? is there something funny ? am I somehow awkward ? One-man band, Boris Paillard, brings his slightly off-key vocal stylings to “Years Are Made of Seconds,” the sixth album release from Canadian indie folk-rock band, The Keys. Once you get over the shock of hearing someone who had too much love as a child and really doesn’t care what you think; the album delivers a strangely attractive and completely unapologetic voice that makes slightly jealous that it’s him singing and not you. The music carries a distinctly Irish influence, which adds to the album’s overall appeal and may help you forgive Paillard when his voice cracks a little. The eight songs range between one and four minutes each and are crammed with a creative blend of instruments; including the harmonica, violin, harp, accordion and saxophone. Still, once Paillard and his occasional backup singers join in, everything fits together somehow; like that odd and undeniably cute couple everyone knew in high school. “Years Are Made of Seconds” is a raw, bizarre and surprisingly charming album that throws a child-like abandon in the face of over-produced, contemporary music. Currently, The Keys has two albums available on iTunes with “Years Are Made of Seconds” scheduled to be released soon, according to the official Web site. foundation beneath each song, a label is irrelevant. This is art, pure and simple. The Keys is driven by Boris Paillard, though it features many guests and collaborators. And with an affinity for so many instruments and styles, and with unique, fearless vocals– something like a gently off-key cross between Thom Yorke and The Dead Milkmen’s Rodney Anonymous, with a slight French accent– genres mean nothing here. The first song, “A Storm Inside the Breeze,” does away with any doubt on that pretty soundly– it is its own genre entirely. Call it, I don’t know, gypsy post-punk, with piano and saxophones? Call it what you will. It’s a frenetic opener, shifting speeds and time signatures, all the while remaining incredibly catchy. But it’s certainly not the end of the surprises. Recorded in various spots across France, the album itself reflects some of that patchwork ethos with its shapeshfting styles. In its chorus, “Room With A View” showcases an accordion and layered vocals, sounding like a mashup of System of a Down’s quieter moments and a sea shanty. I say chorus, though technically it isn’t, since it shows up once and doesn’t return. The song is just over a minute long, and seems it has somewhere else to be. “The Quiet Escape” also comes and goes quickly, though even at its short length it feels like the most fully realized song here, a gorgeous piano composition with lyrics of impressionist dread. Charlotte Cornfield’s drumming in particular shines here, restrained and elegant. This is a tour of sound, but never self-indulgent. Everything feels like it belongs, though with church choirs and accordions, violins and harmonicas, you’d think such a short album– nine relatively brief songs that seem to come and go as they please– would make you feel dizzy, but the experience is surprisingly satisfying. Nothing feels flung together; just fleeting. The brief, unexpected flute jam of “My Pulsing Compass;” the dusty, layered melodies of “The Landlord Prayer.” I would like very much to savor these environments a bit more, though their brevity certainly inspires repeat listens during which the small complexities and nuances you first missed begin to take root and blossom. An intentional effect? Maybe. In this way, a trip through Years Are Made of Seconds functions almost like tapping a memory, the way it is unconcerned with borders, bleeding and coloring and changing shape. We are being funneled from place to place and time to time at Paillard’s whim, traveling through his head space with much the same joy of discovery one experiences while traveling the country, or the world: seeing someplace new for the first time and understanding you will be able to take it with you. very much in the style of Danielson Famile the sombre, nostalgic cover of this EP is rendered ludicrously deceptive and the delightfully scattershot alternative-indie contained within all the more pleasing as a result. From the barmy folk-jazz of A Storm Inside This Breeze to the wonky ballad The Quiet Escape, this is a record bursting with charm and wit that – even when going off the rails – retains a sense of honesty, personality and heart. This is a short, snappy and yet complete feeling nine track album; the sixth that The Keys have self-produced and features a host of Paillard’s family members and friends contributing to a gloriously personal yet approachable record. This album showcases its ring-master Boris Paillard as a formidable musical talent conjuring up an extremely accomplished album, as if Stephen Malkmus and Zach Condon were involved in some sort of 80s bodyswap movie. The Keys is a Canadian based music project fronted by French artist Boris Paillard; Paillard initiates the process by coming up with the songs, the ‘chunes’ and the basic arrangements, he then calls on reliable and like-minded musician ‘friends’ to help him develop the sound, the style the vibe – that’s The Keys! Printed loud and proud on the press pack is the description ‘folk’n’roll'; ok, I can see that but, also alt-folk would be an apt description of what The Keys is all about. Certainly the emphasis is folk-sided; the songs are homely and honest, the music tends towards multitudinally enhanced acoustic so yes, this is folk ‘something’! Paillard’s style is just about as brutally honest as it gets, not the greatest singer in the world perhaps but, someone with total belief in his abilities and perfectly happy to deliver his songs in what is, I suppose, a slightly naively ‘boy-next-door’ manner. For Paillard the key seems to be in the lyrics, the guy’s a musical poet and he seems to be able to keep his songs very real, very live, very low-key but still make a fascinating and compelling sound. Paillard states, ‘sometimes it rocks, sometimes it grooves. It’s diverse and energetic’ – I state, ‘absolutely spot-on’! For me, ‘diverse’ is the best single-word description of The Keys and ‘Years Are Made Of Seconds’ cuz carefully arranged with the normal guitars, drums, bass, harmonica etc Paillard introduces accordion, violin, piano, saxophone and flute – quite a combination, quite a result! Diverse? Oh yes methinks so!! ‘Years Are Made Of Seconds’ is not really an album for the musical purist; Paillard’s vocals are shaky, pitch-shifting and raw and his music is refreshingly jagged, lacking somewhat in finesse but somehow wonderfully rewarding. Paillard’s vocal delivery reminds me very much of a raw-edged Neil Young – similar take-it-or-leave-it execution that’s far from perfect but infectiously likeable. Paillard’s friends seem to ‘sing from the same hymn sheet’ as the ‘main man'; great musicians offering exactly the right kinda support to this bizarrely original songsmith. In fact, everything here is treated with a kinda all-round low-fi attitude and it’s that total honesty and flagrant disregard for the musical rules that sorta makes this fascinating rather than just simply rewarding. The Keys is indeed an unusual ‘project’ and The Keys is indeed ‘folk’n’roll – living proof that over-production and multi-layered perfection isn’t necessarily the be-all and end-all when it comes to the modern musical form – The Keys’ ‘one take’, keep-it-real approach works extremely well and makes ‘Years Are Made Of Seconds’ the intriguing work that it is – honest all day long, absolutely real, an inspired format, an inspirational album – love it!! 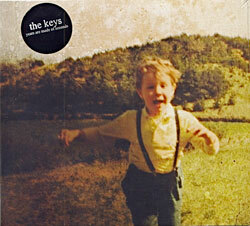 The Keys are a French DIY folk’n’roll band, and Years Are Made Of Seconds is their sixth release. Singing all of his lyrics in English, The Keys frontman Boris Paillard has an endearing voice and a driving passion to release music. This is his sixth album in four years. Paillard seems to split his time between his native France and Montreal – and tends to record with like minded individuals in whatever country he’s living in. Charlotte Cornfield (and her brother Joseph on bass) contributed to Years Are Made Of Seconds. It’s only fitting that Paillard will be touring all over North America with Charlotte for five months from April through August. One can only assume you’ll see both musicians contributing to both sets of music on the tour. Often somber, occasionally eclectic, and very rooted in acoustic guitar & light percussion – The Keys play a unique set of music. It’s likely not for everybody… but his ear for a tune and passion for making music cannot be denied. At nine songs and a little over 20 minutes long, The Keys’ sixth album Years are Made of Seconds is its own decidedly schizophrenic beast. Built around two full-length songs, surrounded by a number of brief interludes, interspersed by three minute-long vignettes, even the artist’s own description of the music as ‘tropical, religious, rock’ is misleading. With the exception of the opening ‘Storm Inside This Breeze’, each adjective Boris Paillard, the sole member of The Keys, offers would cover an individual track, rather than all three conveying some sense of how Years are Made of Seconds actually sounds. Paillard hovers between each genre, unwilling to settle on a cohesive sound. With his David Byrne wail, he oversees folksy dirges like ‘Such a Killjoy’, with its charming accordion, then moves unexpectedly to the dull preach of ‘The Landlord Prayer’. What is for certain, though, is that he is far more comfortable when he has a beat to work with. The album’s three undoubted highlights – ‘Storm Inside This Breeze’, ‘Room With a View’ and ‘My Pulsing Compass’ are all notable for the presence of a genuine rhythm section. Snare drums aside, though, each song has little in common beyond the same nasal voice occasionally grating the eardrum. ‘Storm Inside This Breeze’ is a cacophonic introduction, its bossa nova rhythm overseeing a switch from acoustic punk-power chords to early Pavement to acid jazz horns, all in a neat four-minute opener. ‘Room With a View’, at just over one minute, is all too short, if also the most conventional piece on the record. Finally, ‘My Pulsing Compass’ is probably the highlight; with flamenco guitar and violin riding on the top of a salsa rhythm, it is the track where Paillard sounds most at home, or at least his voice is the least irking. There are too many ideas not fully fleshed out on Years are Made of Seconds. Occasionally, when the stars properly align, the odd good song appears, and in one case the foundations of a good song are left to wither on the vine. Boris Paillard, after five albums, is yet to make his mark. And this, number six, is too brief, and too confused, to alter that reality. The Keys ist eine One-Man-Band bestehend aus dem Franko-Kanadier Boris Paillard, der auf seinem Album „Years Are Made Of Seconds“ so ziemlich jedes Instrument in seine Songs integriert, das man sich denken kann, inklusive Geige, Harmonika, Harfe und akkordeon. Dazu hat er sich fürdie Studioaufnahmen eine ganze Menge befreundeter Musiker ins Boot geholt. Dieser Folkrock ist definitiv mehr als nur gestreift von stilsicherem Songwritertum, und wenn Paillards Stimme den Hauch einer Zehntelnote neben der Spur liegt, so hat das – auch wenn es Puristen zu Tode erschrecken wird – enormen Charme, weil er das Gefühl für das richtige Timing niemals außer Acht lässt. Nichts ist nachlässig oder slackerhaft an dieser Platte. „Years Are Made of Seconds“ ist voller großer Gefühlsmomente ohne Gespreiztheit, und ein Label sollte sich dafür auch bald finden. En 2005, Boris Paillard embrassait une carrière solo sous le pseudonyme de The Keys. Quatre ans plus tard, le Toulousain en est déjà à son sixième album. Et il faut reconnaître qu’au fil du temps, il est devenu de plus en plus performant. Surtout dans le domaine de la composition. Ses rencontres, ses concerts accordés en France, aux States (NDR : à Boston !) et surtout au Canada (NDR : notamment à Montréal et Toronto), où il a séjourné durant quelques mois, ont permis à ce jeune troubadour d’acquérir une solide expérience. De retour au pays, Boris s’est donc lancé dans la confection de son sixième elpee. Et pour la toute première fois, il a pu bénéficier d’infrastructures professionnelles. Le studio, bien évidemment. Sans oublier un ‘authentique’ mastering. Ce qui a apporté, évidemment, un réel plus à cet opus. La musique dispensée tout au long de « Years are made of seconds » évolue quelque part entre folk, rock’n’roll et country. Les mélodies sont subtiles et efficaces. Son timbre nasillard et ses inflexions imparfaites rappellent l’excellent Daniel Johnston voire André Herman Düne. Toute une série d’invités sont venus apporter leur collaboration dans une ambiance, ma foi, fort familiale. Monsieur Paillard joue ainsi de l’accordéon sur « My pulsing compass », alors que la chorale de sa chère mère s’illustre sur plusieurs titres (« the pagan song », « the landlord prayer »). Tout au long de ce disque, Boris Paillard nous raconte des histoires empreintes de poésie. Dommage que le trip soit si court. Trente minutes ont manifestement de quoi nous laisser sur notre faim. N’empêche, la France a peut-être trouvé un véritable talent, issu d’un univers bien différent de celui que nous impose la téléréalité. La dernière fois qu’on avait eu des nouvelles de The Keys, le groupe se limitait grosso modo à Boris Paillard, son chanteur et guitariste, tout juste accompagné d’une chorale de copains. Le Français, installé dans la Belle Province, a depuis étoffé son groupe et, même si sa musique n’a pas fondamentalement changé (on y retrouve le même folk brinquebalant et joyeux, joué avec le même enthousiasme communicatif), le groupe prend sur ce court album (9 titres, une vingtaine de minutes) une jolie dimension : par ces nouvelles touches bienvenues (une basse bien présente, un piano de-ci de-là, un accordéon parfait – notamment sur « Room With a View » -, un harmonica, des cuivres, une batterie, un violon…) le son prend de l’ampleur, au service de chouettes mélodies qui évoquent toujours l’esprit chahuteur des Violent Femmes accompagné d’une pincée de nonchalance à la Pavement. Sans compter les fondamentaux de The Keys : une voix bien identifiable, souvent plaintive, et des copains qui viennent faire les choeurs. Les chansons, qu’elles penchent vers le folk direct et débridé (le premier morceau ou le sympathique « My Pulsing Compass ») ou vers plus de mélancolie (« Such a Killjoy » ou la première partie de « Mind the Gap / Heart the Gap »), vont décidément à l’essentiel : les durées des chansons tournent autour de la minute pour trois d’entre elles, la moyenne doit être à 2mn30 et la plus longue (3mn49) juxtapose en fait deux morceaux ! Mais c’est un format punk qui va comme un gant aux chansons de Boris Paillard et de toute sa joyeuse troupe et ce sympathique « Years Are Made of Seconds » confirme tout le bien que l’on pensait déjà de The Keys. “The Keys Is A One Man Band” : un certain Boris Paillard est le Montréalais responsable de cette petite bombe folk qui le revolver sur la tempe, est prêt pour un marathon musical et vous laissera sur les rotules. Une voix nasillarde bavarde et énervée pour des chansons flirtant avec un pur folk-punk ou pop-folk usant des plus belles harmonies vocales. Imaginez l’énergie punk d’un Jeffrey Lewis couplée aux élans mélodiques des Bowerbirds, ou l’urgence d’un Frank Black qui aurait réussi une envolée folk plutôt qu’un crash country et vous aurez une petite idée du travail réalisé sur ce “Years are made of seconds” enthousiasmant. Si vous avez des portes à ouvrir j’ai un trousseau de clés à vous proposer. Sur notre dernière livraison compilatoire nous vous offrions la possibilité de faire connaissance avec ces clés qui n’ont rien à voir avec les portes, surtout celles de la perception. The Keys serait plutôt à ne pas quitter le terre, de même entrer en elle pour en sortir des histoires à dormir debout, et de jouer une musique qui prend racine pour ne pas vaciller. Avec Years Are Made Of Seconds, The Keys se libère, joue même les aventuriers intérieurs, des aventures à l’échelle d’une fourmi qui quitterait la colonie pour des vacances canailles. De son périple ce sont des pépites comme “The Pagan Song” qui se retrouveront dans son sac à dos, une pièce de collection qui ne nécessitera pas d’expertise chez un revendeur. Ouvrant des portes nouvelles, The Keys ne réalise pas un disque anodin, il se débarrasse de sa première mue, et mange cette peau maintenant morte pour la régénérer en une matière totalement désinhibée. Disque ramassé, comme une lettre de vacances, Years Are Made Of Seconds est une clé des champs, une jolie pirouette au chemin droit saignant la terre. 3153600 bonnes raisons d’écouter the keys cette année. Il semble qu’à l’heure du tout écolo, la musique folk revienne en force. 2008 a frissonné sous les caresses de Cocoon, Brisa Roché ou Moriarty, et 2009 semble porter, elle aussi, bien des promesses. Quelques accords délicats, une voix fragile et des textes qui sentent bon les promenades loin de la ville, ça ne se refuse pas ! C’est ce que propose The Keys avec ce sixième album autoproduit. Boris Paillard, porteur du projet, navigue entre plusieurs eaux, de l’onde tendre des grandes plaines américaines aux flots troubles de la Garonne, d’où il est originaire. Une voix qui n’est pas sans rappeler celle d’Alec Ounsworth (Clap Your Hands Say Yeah ! ), des ambiances un peu désuètes, un peu pittoresques, des choeurs chaleureux, l’omniprésence d’une simplicité reposante, des mélodies entraînantes…Un petit album parfait pour attendre le retour du printemps !